Oooof that scoop on Zero. I think robots the country wide have nightmares about facing Don't Hug Me. I think Valkyrie is overall my favourite ant weight from this forum or that I've seen in person. Such a nice looking little bot. I'm a bit sad I had to miss this event. Can't wait to see the video. Am planning on coming to the one in June! What's your next project gonna be? Any more ants in the pipeline? Yeah, I'm glad I chose a big lump of steel for the scoop or things would be much worse, Don't Hug Me put a huge slice clean through the chassis of Stewie at the aws. Valkyrie needs a fair bit of work, the main aluminium side section wants replacing, it's really deformed around the front and it needs to be square for the weapon to spin. I'm also planning some upgrades to make the front tougher so this doesn't happen again, and changing the weapon motors for a more powerful and robust model! Once I get that done I've got some more plans, a new version of Zero is fully designed and just needs building. And I'm also working on a walking version of Vampire, but getting the walking mechanism right is taking time. All your bots looks so good I'm excited to see what the extra versions look like! Not really sure how doing a handstand on the axe (axe-stand?) is going to help it win anything, but I like it anyway! I know you lot had a few pints that day but I didn't know the robots did too! Well I've not had enough time for any new robots recently but with the AWS around the corner I've been getting my team in order. 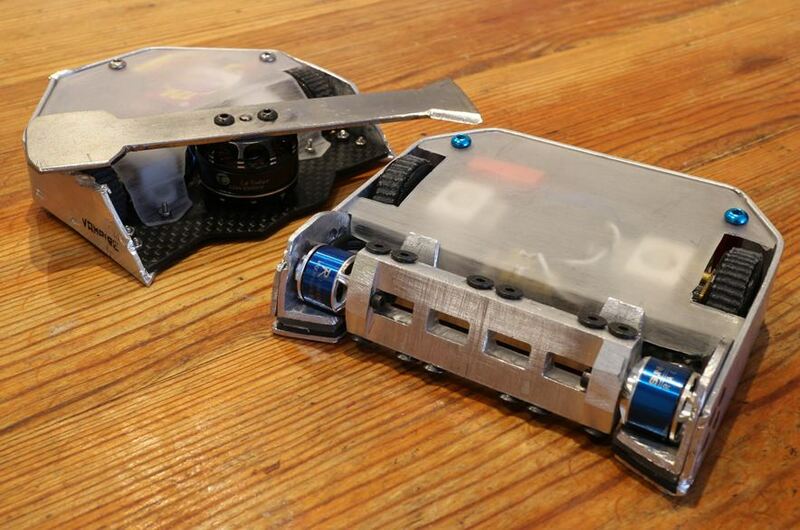 Valkyrie's now sporting new weapon motors, which means it can run at the 35,000rpm top speed of the esc. It makes one hell of a racket now, and should give me a decent boost in weapon power. Vampire's got a new chassis baseplate, which provides a more stable mount for the weapon. I ran this new part at BBB2 a couple of weeks back and it proved very effective, particularly in a brutal rumble with Don't Hug Me. Just need to make a minor electrical tweak and I'll be good to go! I am really, really, hoping mine will not get drawn against those in the first round. So well built, so scary. Cheers, I must say it's nice to have reached the stage where people are scared of my machines rather than the other way around. Talking of scary robots, further testing has revealed that Valkyrie's new weapon motors have had a bigger difference than expected. Half throttle is more powerful than full power was before, and I can now get some sweet gyro dancing. The downside being that the vibration is pretty out of control at high power and things get really hot if run for any length of time. I guess time will tell how that works out. Definitely your machines command a bit of fear. I'd happily fight any of them next week....but.....I'd prefer it if it wasn't in the very first round yeah? AWS 55 proved both excellent fun and very successful for the team. Zero picked up 3 wins and I was pretty happy with it's performance overall, only losing to the then reigning champ ALBOF, and a raised bit of floor. Vampire picked up a couple of wins with it's standard record of winning against lightly armoured bots, but losing to anything with half decent protection. Valkyrie was the star of the show for me and achieved 4th place, my highest AWS finish! After losing it's first fight it wasn't looking good, but a remarkable 9 (yes nine!) fight winning streak took it well into the finals before Anticide finally stopped it. A couple of the fights I can't wait to see again; the match with Sir Digby was very tight, I lost the weapon early on when a bit of bent chassis jammed it up, but a later hit from Shakey's spinner freed it again and I eventually took the win. Another notable fight was one I was dreading, against Nom Nom Nom. Valkyrie has always fared badly against big horizontals, but I wound the drum all the way up and went for it. I have no idea how, but much to my surprise the first big hit ripped my opponents weapon bar (including half the motor) and both tyres off in one go! Shakey also kindly asked me to drive the green third of wedge wedge wedge, which was excellent fun (it's really impressive quite how good those 50g bots are), and I don't think I even let the side down too badly. Huge thanks to Chris and team for running an excellent event, and it was great to see so many new robots and roboteers. Already looking forward to the next one! Congrats on Valkyrie's really good showing. Cemented it's place as my favourite 150g robot on our scene. The incredible noise it makes combined with how nippy it is with the gyro dancing really makes it very memorable. Next time a podium finish? I think he's good enough. Thanks for the first fight. I think I was unlucky for drawing you first, especially as that was the one I was most worried about. I think I got lucky in the first fight. you had me in the second. Very impressive robots. Very impressed I stood up well to the attacks. Axiom's been getting some subtle improvements.. Evolutionary rather than revolutionary would be the best way to describe the changes, but it's been improved in a number of ways. It now has a better wedge on the front to get under opponents; I've trimmed a few grams from the axe for stability; and I've beefed up the armour. I've also cut down the number of nuts and bolts used (more chemical welding) so it's simpler to work on. It'll definitely be back in the team for AWS 56, and hopefully it should win a few fights! 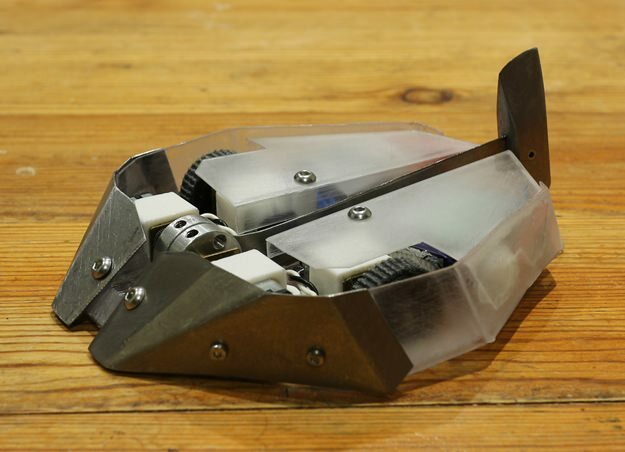 That's such a good looking hammer bot, can't wait to see what it can do.